Damien Hirst. I Want to Spend the Rest of My Life Everywhere, with Everyone, One to One, Always, Forever, Now. Booth-Clibborn Editions, London, 1997. Large 4to. As new in publishers cloth in like dustjacket (taken out of the publishers shrink wrapping merely to check signature was present). Original faux leather boards embossed and gilt decorated. 334pp. Illustrated throughout in colour including 7 pop-ups, gatefolds, die cuts and other special features including ephemera laid in and poster at rear. SIGNED by Hirst; highly collectable in its signed form as Hirst (the Duchamp of our time?) has become unapproachable especially with a big book under your arm. Complete 'Goodie Bag' given out by Damien Hirst and White Cube at Hirst's 'Beyond Belief' exhibition. 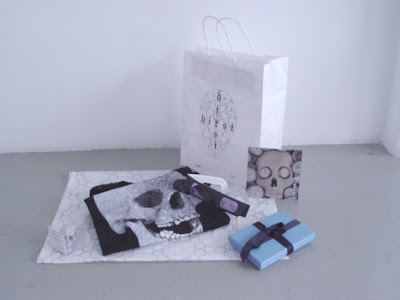 It contains a 'For the Love of God' T-Shirt, a Smythson customised leather skull note book, a CD of The Hours, a white chocolate and glitter skull sweet and five pairs of HoloSpex glasses to view the artist's diamond encrusted work - 'For the Love of God'. 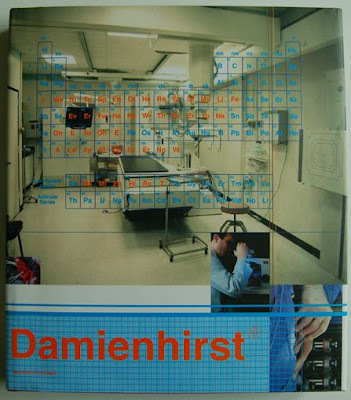 Sold with a signed and inscribed copy of Damien Hirst's book, 'The Death of God'. They failed to reach a reserve of £600. The earlier £100,000,000 sale of Hirst art at Sotheby's also in September is now being seen as the apex of a market in swift decline, a sort of dead cat bounce deftly directed by Jopling and Hirst. Real artistry there. OUTLOOK. Hirst is unlikely to suddenly implode, too many people are invested in him and he is still the greatest talent of the Brit Art crowd. Hard to buy a signed one at less than £1000. A copy at £1600 has been on the web now for 3 years. Prices will probably remain good for unmolested examples of the book. Even though the Gordon Burn essay is of a high order it is best to read it elsewhere or with great care. 'Goody bags' are best avoided -many major stars would not have been to a reception this century where there wasn't a goody bag and might require sessions of therapy if the goody bag wasn't good enough, as it were. I haven't heard of significant collectors of the items-- they may well be traded on Ebay? Just to say I bought a 1997 copy of 'I want to spend'. It was opened once and shut v. quickly as the viscera therein put me off. I'm sure it has all its bits and bobs inc. the poster - but no signature - I wonder what its worth? Check Abebooks.com but I suspect Damien is in descent, quite alot about. His last show was really bad.